First things first. I have been fighting this for a couple of weeks now but I'm going to have to go off line for about three weeks. I'm going to Spain this week for my brother's wedding so there will be no posts for about ten day even though I will try the odd Photo of the Day. I also have my final law exams coming up at the end of this month so they will have to take priority. I won't go off line totally post wedding pre exams as Gubu World helps keep me sane but it will be a solid four weeks until normal posting resumes. 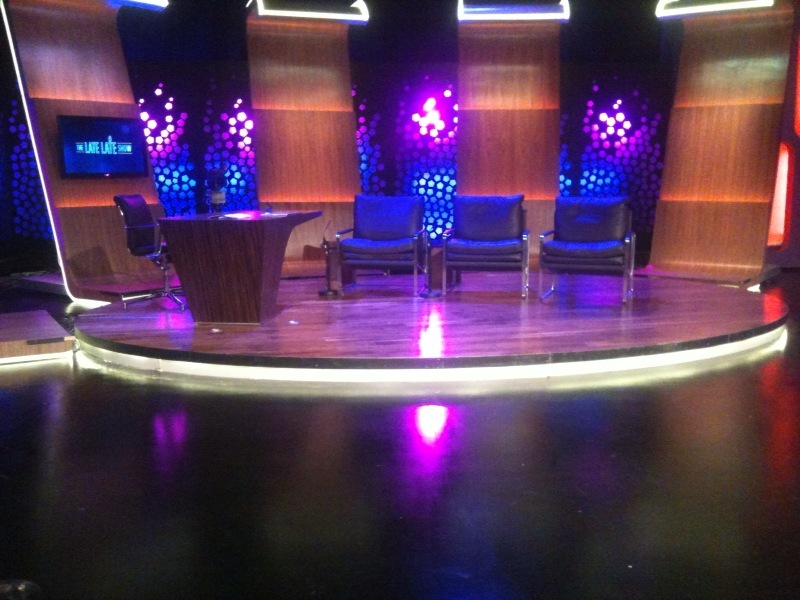 My view of the RTE studio from the second row of the audience. I wanted to take a quiet snap during the interview but was warned off doing this in no uncertain terms. 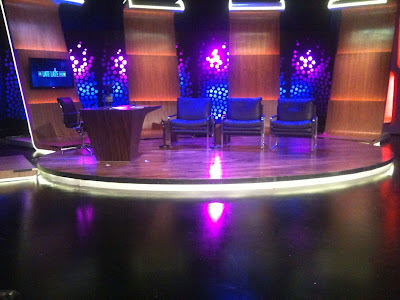 Last Friday I managed to get tickets for the The Late Late Show audience for the first show of the season. 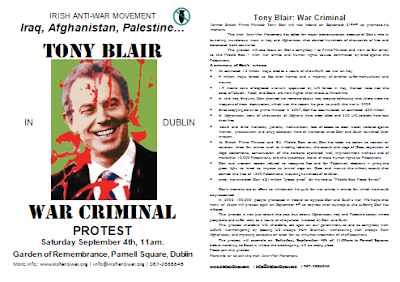 I wanted to go because I knew Tony Blair would be the first guest and I was eager to witness his only live interview during his tour to promote his autobiography. I was also hoping I might get to meet the former Prime Minister but his security made it very clear there would be no opportunity for hand shaking or photographs. Security had to be tight as there were a couple of hundred vocal anti war protesters at the gates of RTE. Incidentally, I must declare the sight of these protesters holding up banners such as "Tony Blair is a Terrorist" alongside banners being held by equally vocal and eccentric teenage fans of Jedward (who came on the show after Blair) as one of the funniest things I have ever seen. No doubt Blair's private security (identifiable by what I think was a British legion pin on their lapels) were concerned that a demonstrator from outside would infiltrate the studio audience for some good old fashioned heckling or perhaps even make a dash for the former premier. I tested this a couple of times out of curiosity by deliberately fidgeting in my seat. A Blair security man, all of whom kept their eyes permanently on the audience would immediately fixate his eyes on me. The interview itself was generally good although as you will see Blair did get frustrated with some of the questions. I have always found Tony Blair fascinating. I recently finished Johnathen Powel's (Blair Chief of Staff) book on the role of the Blair government in the Northern Irish peace process. It is quite startling just how involved the British government was at Blair's direction on every aspect of the process. I won't go into Iraq right now although I do have very Strong opinions about the invasion that I have never expressed on Gubu World. That will be my next major post. But Blair did articulate one thing very well in my opinion. We sometimes forget that decision making on matters crucial to global securities are ultimately made by human beings, and in the case of the Iraq war, by Bush and Blair alone. 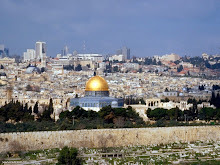 They alone ultimately had to decide whether their countries would participate in the war. When you are confronted by a set of facts, without hindsight, all you can do is what you think is right. There are very few people in the world who can truly understand that burden. Apologies for my absence over the last number of days. It has been one of those weeks. I am working on a post to coincide with the withdrawal of American combat troops from Iraq. I hope to post it Thursday morning. Quite appropriate really, particularly since Tony Blair is coming to Dublin on Saturday resulting in posters of protests springing up along the cities lamposts and bus stops. More on this over the weekend.